How many communities are there in Calicut, apart from the local Hindu, Muslim and Christians ? As a busy trading centre and entrepot of renown during the medieval times, Calicut naturally attracted various nationalities. Many of them have made Calicut their homes or have left indelible impressions. These include not only Europeans and Arabs but even local traders from Multan, Punjab, Gujarat and other places. All of them have contributed to the rich tapestry that makes up Malabar culture. Many of them have vanished without a trace; but several groups continue to live here and contribute to the cultural milieu which gives Calicut its distinct flavour. Who are these and how many such micro groups are there in Calicut? No one seems to have made an attempt to chronicle their lives till K. Mohan, a cultural-historical tour guide and the co-ordinator of the Calicut Chapter of INTACH (yathramohan@hotmail.com) has attempted the task. In an inspiring talk (at the monthly meeting of Calicut Heritage Forum ( http://calicutheritageforum.googlepages.com ) based on his forthcoming book on Cosmopolitan Calicut, Mohan listed an incredible list of 32 communities which have come from outside (or are the progeny of outside visitors/traders) but have made Calicut their homes. Some like the Eurasians have limited presence – the Dutch and Anglo-Indian families have migrated but some Portuguese-related families are still present as copper smiths. The Arabs – mostly from Yemen (Hadramouth) but some from Saudi Arabia – are represented by the Thangal families. There are Sindhis, some of whom came as traders, but many others as evacuees from Sind, Pakistan, after the partition. They have a temple on the Silk Street ( near Bombay Restaurant). There are Hindu and Jain Gujaratis, a vibrant community which has managed to assimilate fully with the local culture, while retaining their identity. They maintain both Hindu and Jain temples. Originally copra traders, they are now into all forms of wholesale and retail trade, apart from the services sector. A third group of Gujaratis are the Kutchi Memons who were perhaps the first group to have come from Gujarat. Their speciality is wholesale trade of grain and sugar. Mohan mentions some interesting snippets of their trade practices: they send their children to fellow traders within the community as apprentices to learn discipline as much as trade. Another trait of this community is that while they are very stingy on giving donations, they are liberal with loans! The few Maharashtrian families – reported to have fled Ratnagiri to avoid some persecution – are a closed community, generally keeping to themselves. Many have migrated to Bombay. The Parsees came to Calicut originally as timber traders. 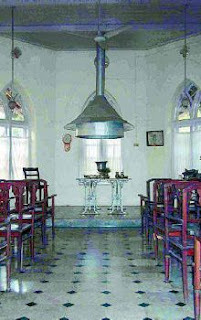 They maintain a Fire Temple ( the Parsi Anjuman Baug in the busy Sweetmeat Street - see picture above) which is the only such temple in Kerala. Worship is not regular, as no priest from the community is available. The Parsis of Calicut are today represented by the seven member family of Darius Marshall, who is an institution by himself. A small Goan community exists in Calicut, engaged as copper smiths or goldsmiths. An interesting linguistic group is the Telugu speaking population which consists of the Dakhani Muslims who are small in number and the Chakkiliyas (cobblers) who migrated from Vijayanagar empire. They were brought here as expert makers of saddles, sword sheaths and shoes but have today ended up as street-corner cobblers and shoe-shines, speaking a weird language, probably related to Telugu. Naickers who speak a mixture of Tamil and Telugu are another colourful community. They claim to be Yadavas and their primary occupation is buffalo-rearing. They have a boisterous wedding function which ends up in a drunken brawl with the drunken bridegroom swearing at the bride and making her promise that she would implicitly and without questioning obey him! The Naidus, a small trading community, is also present in Calicut. There are 11 different types of Chetties (like Nattukottai, Kasi etc) who deal in hardware, bangles etc. They are superstitious about dealing in perishable/ breakable items such as ink etc. Tamil groups are also numerous. We have the Nadars who are expert traders. They have a belief that whatever they earn in Calicut is spent here itself. This is expressed in their saying in Tamil :Kallikkottai kaashu Kallai paalam thaandaathu – money earned in Calicut will not cross Kallai bridge !! There is a small group of Nadar Christians who are Protestants. The CSI Church in Chalapuram ( on Madhavan Nair Road ) even has a special service in Tamil for this community! In the early 1930s, the Calicut Municipality was in a fix. They had popularised individual latrines as part of the move to discourage open defecation. But, these new latrines required someone to carry the night soil. Then, as now, no Malayali would do such unclean jobs! So a delegation from the Municipality went to Erode and Salem in Tamil Nadu and managed to recruit persons from the Paraya community with promise of jobs. They were also expert in making baskets and other items from bamboo. There were small colonies of Parayas in many wards of the municipality. But after the ban on carrying night soil, they have diversified. Some have inherited the cleaning jobs in the Corporation and others have joined the Kudumbashree movement which is collecting domestic garbage for centralised treatment at Njelianparambu. The Tamil-speaking Tulukkans who came from South Arcot must have originally come with Tipu's forces. Like the Ravuthers of Cormandel, they were expert horsemen. The barbers of Calicut have all come from Tanjore district. The new generation of Professors (they write Pro. for proprietor!) Pachamuthu and Raju continue the profession with modern men's beauty parlours. Kannada speaking Pattanis originally came as contractors (probably to Tipu and company) They have come from Srirangapatana and should not be confused with the Afghan Pathans. The pattan in Pattani is the short form of Sriranga-pattana! They still have a presence behind the Paragon Hotel where, being Shia muslims, they celebrate the Muharram with a Tazia procession. (The place is called Kootarappura, where they used to have bloodier observance of Muharram in olden times). They were also allowed to conduct Pulikkali during Muharram. Another Karnataka group is the Bhatkal muslims (called Vattakkoolis in Malayalam) who are shrewd businessmen. Konkanis from Mangalore were brought in as expert tailors. (Intervening in the discussion, MGS remarked that there were no tailors in Calicut as tailoring was not required because mundu was woven as such and women did not wear any upper garments – so much so that when the Zamorin appointed a Tailor, he was given a title Thunnara Chakravarty (Emperor among Tailors)! Chetties were brought from Cochin to make Pappadums and Nazranis came from Trichur as retail traders ( they used to close shop on Saturday and travel to their home towns for the Sunday service) The Kumbharas (potters) came with Tipu and settled in Nilambur where good quality clay was abundant. There is a small community of Vellamkoris (literally, those who draw water) from Kasragod whose only job was to draw water from Mananchira tank and carry it on shoulder to the homes of Konkanis. What fantastic variety! Thank you, Mohan. I have some doubts about the origin of Beypore Khalasi's. As far as I have gathered they are ship builders & ship workers of Yemeni extract. The term kara khalasi (black ship worker) eventually became the 'laskar'. The Khalasi was also a term used for a working class related to railways (it is still a position)and were i think originally magazine and arsenal men or tent pitchers of the british army. I assume they lived in kalasi-palayam?? the barbers - i remember the hair Pro at Balus from the days they were at SM street to the new location at mavoor road. Thank you very much, Maddy. I agree with you on Khalasis. That was why I had put in brackets my comments (needs more research). I would like to believe that they are home-grown. There was a lively discussion on the jews. MGS confirmed that there is no evidence whatsoever about their existence in Calicut, although I quoted from Velayudhan Panikkasseri's observation that there was a jewish colony in Chaliyam. He gave the interesting bit that all the old jews of Malabar were black jews and the white jews started arriving only in the 16th century or so. Thanks for the bit on half Chinese. I shall refer it to Mohan. Thank you, Madhusudan for this information. Until recently there was no CSI church in Chalapuram. The church is of recent origin. The compound where the Church now stands was the Chalapuram Sub Registrar's Office, a few decades back. The CSI got it only recently. They started a school there and by the side of the school where the Church now stands they had established a small prayer hall. I am impressed with the article and with the blog itself. Being from Calicut, it is heartening to see a blog on its historical aspects. Please continue the good work. Fascinating. Calicut is a veritable melting pot. Thanks for sharing. Many thanks, Antiraoranter and Sukumar for the kind words!! I am very happy to find this blog.I would like to thank you for this great read!! I surely glad every little bit of it and I have bookmarked to check out new stuff you post. Excellent article....thank u for providing this information! !But u missed out another gujarathi community called Dawoodi bohras...they are shiah muslims.They have a mosque in south beach.There are around 30-40 families in calicut. Thank you, Ahmed. You are right. Bohras are still contributing greatly to the variety and richness of Calicut culture. It is a significant omission. As you might have noticed, we were reproducing a speech of Mohan. It is possible that we missed out this reference from his scholarly speech. Thanks, once again and keep visiting!